Last year a vintage quilt cataloging task force went from city to city in New Mexico, and when it came to my town, I participated in the event. I think they were gathering pictures and stories about quilts in preparation for the state's centennial next year. A quilt was required to be 100 years old to be recorded, but people were invited to bring other old quilts to share. A little information rubbed off on me that day, More importantly, I learned about the appreciation people have of the old quilts and their place in the families' histories and how important it is to record the details about a quilt before it is lost. Since then I make a point to look for old quilts when I'm at estate sales or garage sales. I look for quilts that are "buried treasures" -- those that have little or no value to the seller and are frequently buried under layers of dirt and neglect. I bought this gorgeous quilt at a crowded estate sale where there was not even enough space to open it up and examine it. Based on the portion I could see, I could tell there was some wonderful workmanship, design, and vintage fabric under the dirt and stains, so I decided to take a chance and buy it. After I got it home and unfolded it, I wasn't so sure of the wisdom of my decision. It smelled mildly of smoke and had a few blood stains that went through all layers. Other stains led me to think that perhaps it had been lining a dog's bed. My husband was ready to drop it in a garbage bag and take it directly to the dumpster. I relied on several sources of advice for cleaning this quilt. A wonderful book on the subject, Quilt Restoration: A Practical Guide by Camille Dalphond Cognac has excellent recommendations about washing and storing vintage quilts. I also searched the web for "cleaning vintage quilts," as well as hints for removal of specific stains, and for methods of cleaning that wouldn't damage the delicate fibers. In laundering vintage textiles, agitation is detrimental to the fragile fibers, so washing quilts by hand in the bathtub is often recommended. Cleaning this star quilt was a long, arduous task. The water ran yellow/brown for at least 4 washes in the tub, and then I started on the stain removal. I was careful to avoid breaking stitches in the washing procedure, but the filth definitely required action! It took several days before the water ran clear and then more days before the stains lifted. It still has some faint stains, but they are not bad. Anyone would feel cozy and comfortable if wrapped up in this quilt now. My husband agrees that it looks and feels nice. The fabrics in this String Star quilt are great! It is definitely folksy in appearance. 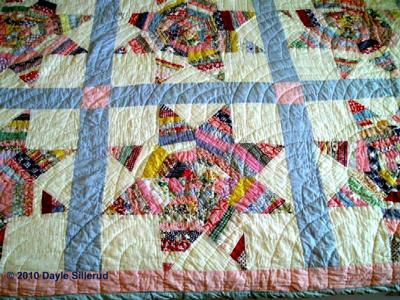 Eight diamond shapes pieced from strips or "strings" of fabric are used to make each star pattern. The result is a pleasing scrappy look with small pieces of random colors. 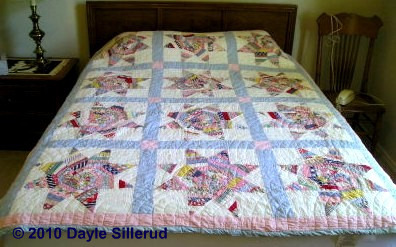 The hand-quilted stitches are nicely done in beautiful curves that provide contrast to the lines of the stars. The backing is blue with a turnover binding. I attended a seminar on quilts from the 1930's that highlighted some of the popular block styles of the time, as well as the colors commonly available in yard goods at the time. I would guess this beauty was made in the 1930s or 1940s.